Superior Surface Cleanser - MR. PINK is the perfect way to remove dirt, grime, and debris while maintaining the quality of your paintwork. The advanced formula is tough on dirt, yet gentle on wax and sealant. MR. PINK is super concentrated for a 1:4000 dilution ratio. This means you only have to add 1oz to a 5 gallon bucket to achieve a perfectly clean surface. MR. PINK will change the way you wash your car forever. It's the perfect detailing shampoo for any situation. The technology incorporated into it is truly high-tech. The high foaming formula creates an extra slick wash solution that allows your wash mitt to easily slide over the surface. 95% of swirl marks, scratches, and marring are caused from improper washing. The unique formula releases a constant discharge of foaming bubbles that surround and capture dirt particles allowing them to be removed safely and easily without scratching the surface. The pH neutral formula gives MR. PINK the ability to clean any surface safely and easily. 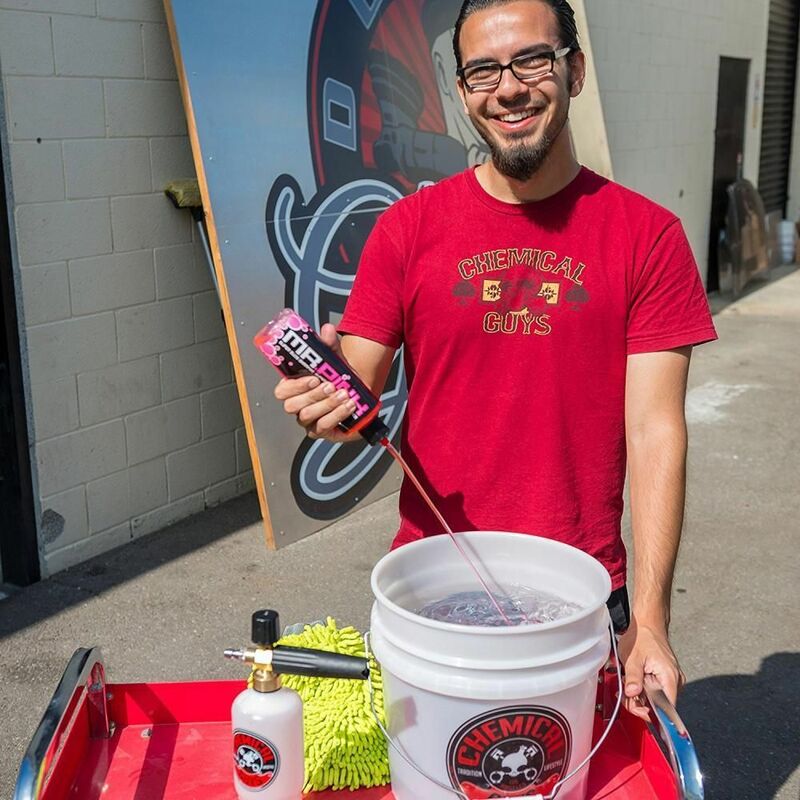 It gives any detailer ultimate versatility when detailing any car, truck, motorcycle, boat, or RV. Keep your vehicle looking great all year round with MR. PINK from Chemical Guys. Don't use the same wash water on your car's paint as you do your tires and wheels. Mix one cap full of product with one gallon of water in a clean wash bucket. For using as snow foam with a foam lance, fill the plastic bottle with warm water leaving a slight gap for the shampoo, add 2 to 3 oz (60 to 90 ml) of Mr Pink shampoo.